The 56 passenger coach is both comfortable and luxurious. Able to hold up to 56 passengers, this bus can comfortably seat a large group of students, corporate travelers, or even wedding guests over short or long distances. Securely store all of your luggage and carry-ons with overhead storage and spacious luggage bays underneath the bus. 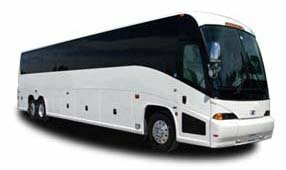 Phoenix Charter Bus Company is available all day, every day to help schedule your bus rental. Call us at 480-445-9823 to learn more about our services and book your own bus!